CREATING TRULY AUTHENTIC ITALIAN PIZZA. Wait. It Gets How Hot? with a cooking time not exceeding 90 seconds. This oven rests on a reinforced iron structure. Hand-crafted in Modena, Italy using a unique refractory material devised by master oven builder Aldo Pavesi, these are the only wood fired pizza ovens in the industry that can offer a solid, single piece baking floor backed by a 10 year warranty. 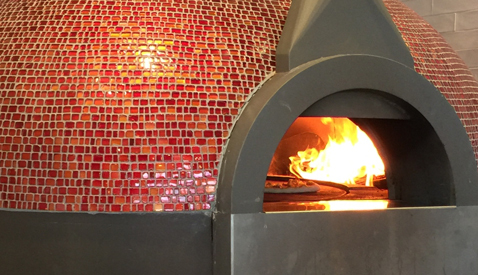 All Pavesi brick ovens have excellent heat retention and can hold any required baking temperature, in accordance to the preferred style of pizza. Aldo Pavesi, b. 1946 in Modena, Italy, is the master oven builder responsible for the world renown of the Pavesi Brand. Aldo studied as a refractory engineer for the ceramic goods industry, designing the refractory ovens to bake ceramic household products. These years spent perfecting different refractory recipes and dome shapes provided Pavesi a deep understanding of the unique properties of refractory material components. Aldo founded Pavesi Forni SRL in 1969, with the development of the single piece refractory baking floor. To this day, no other oven company has been able to successfully replicate this feat, which provides incredibly even heat transfer across the floor and reduces cracking. His belief in his product is so firm that he offers a 10 year warranty on his ovens - an unheard of warranty in the oven industry. Although Aldo Pavesi continues to oversee production, his children, Alessandro and Elena, have joined him in their successful family business, preserving the secret refractory recipe that sets the standard for wood fired ovens.